This exhibition is part of the museum's observance of the 150th anniversary of the arrival of Japanese—gannemono (first-year-folks)—in Hawai‘i. As an island nation surrounded by the sea, Japan reveres water. Japanese textiles featuring water motifs—such as ponds, rivers, whirlpools, waterfalls and waves—are popular and prevalent. In Japanese culture, this primary force of nature represents the passage of time as an endless flow—one that is fluid, flexible and resilient as well as sacred and pure. Interpretations vary from naturalistic renderings to stylized abstractions, marking a single moment in this eternal rhythm, as a reminder that all things are in a state of flux. In this exhibition of luxurious kimono, garments and textile fragments, you can see that water is more than a graphic element—many motifs are named, linking them to cultural values charged with hidden meanings. Woven, dyed and embroidered renderings include large powerful crested waves, kata-onami, which denote vitality; koi swimming upstream, which are associated with strength and perseverance; and swirls of water, or Kanze mizu, named after the Kanze family of Noh actors, which are a conventional treatment of flowing water. 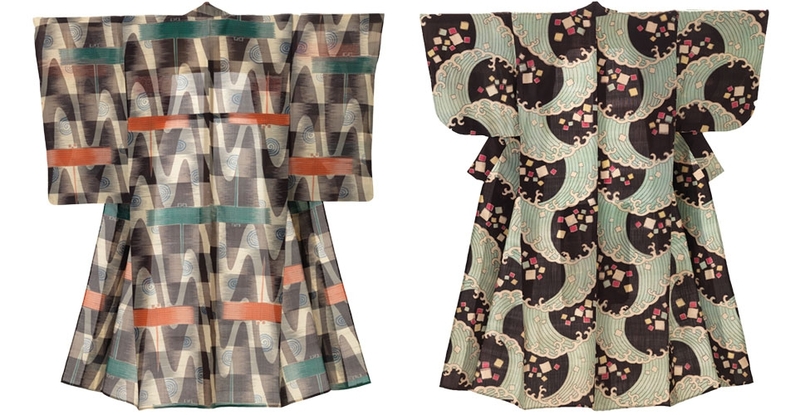 Concentric circles form arches that resemble overlapping waves known as seigaiha, or “blue sea wave,” signifying auspicious surges of good luck, are preserved on an 18th-century fragment and echoed in a 20th-century kimono. Originally found on ancient Chinese maps as a marking for the ocean, this emblem can be construed as a device to promote peace, analogous to one provided by a calm sea. Landscapes inform a sense of place as maple leaves gently floating downstream, turning the water red, bring to mind the Tatsuta River. Alluding to fall’s melancholy seasonal change, this references a poem by the legendary poet Ariwara no Narihira (825-880). Dragonflies start their life in water and are abundant in summer and autumn, so paired water and dragonfly motifs are commonly found on women’s summer kimono, three of which will be on view. Because dragonflies can only fly forward, they also signify agility and authority and the name, tombo, meaning “victory insect,” was linked to samurai strength and bravery. See more events related to the 150th anniversary of the arrival of the first Japanese immigrants in Hawai‘i.